It’s been a hot summer in Sydney and even though we’re a few weeks into autumn there are still a lot of lovely tomatoes available at the markets so I’ve been making the most of them while they last. This super tasty recipe is from Giada de Laurentis and it makes a wonderful side dish to a steak dinner. In the summertime I usually make a steakhouse-style fresh tomato salad with red onions and dress it with a sauce that’s similar to steak sauce but with a bit of a vinegar kick (if you’ve ever ordered a tomato salad at a New York steakhouse you’ll know the kind of salad I mean). 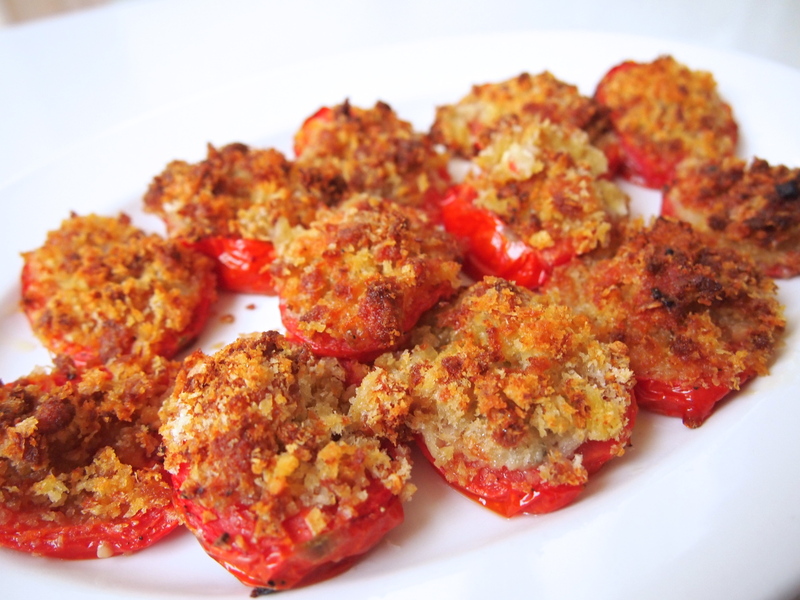 But the last time we were grilling some steaks I felt like a change and these little roma tomatoes stuffed with blue cheese and breadcrumbs didn’t disappoint. Next time I’ll make extra as they would be awesome chopped up and added to warm pasta. In fact, I did have a few left over and a couple of nights later when I was making spaghetti and meatballs I added them to my meat mixture and those meatballs were some of my best yet. This is an easy and quick side dish to make and can be prepared ahead of time and baked just before serving. Giada serves these as a canapé which is a great idea, just make sure you pass out a lot of napkins as they may be a tad on the messy side for finger food. Preheat the oven to 180C. Using a teaspoon remove the seeds from the tomatoes, leaving the cavity completely empty. 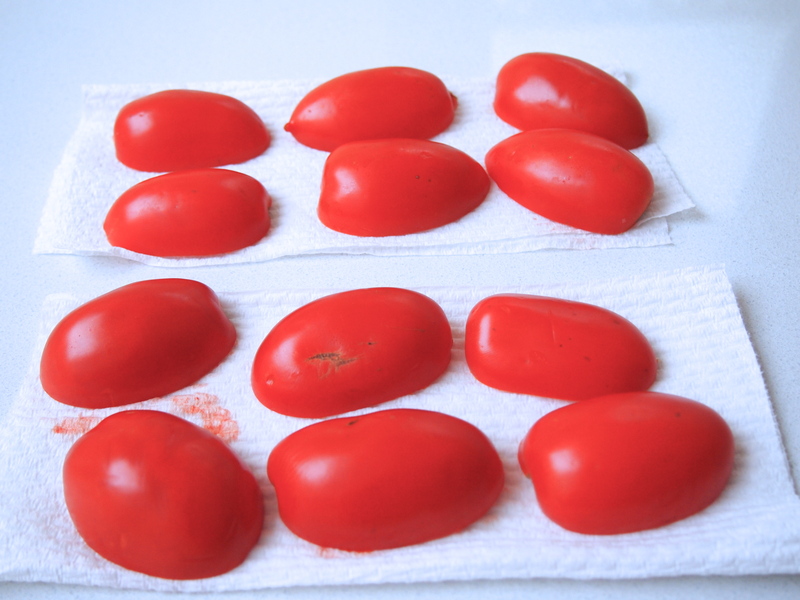 Place the tomato halves, cut side down, on paper towels to drain for about 5 minutes. In a large bowl, mix together the 2 tablespoons olive oil, garlic, salt, and pepper. Using clean hands, gently toss the drained tomato halves in the oil mixture until coated. 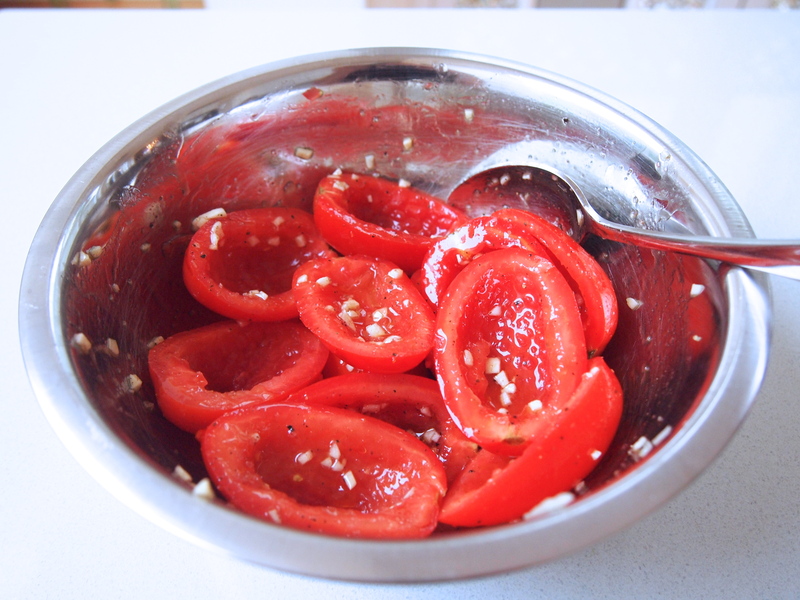 Marinate the tomatoes for 10 minutes. In a small bowl mix together the bread crumbs, gorgonzola, parmesan and parsley. 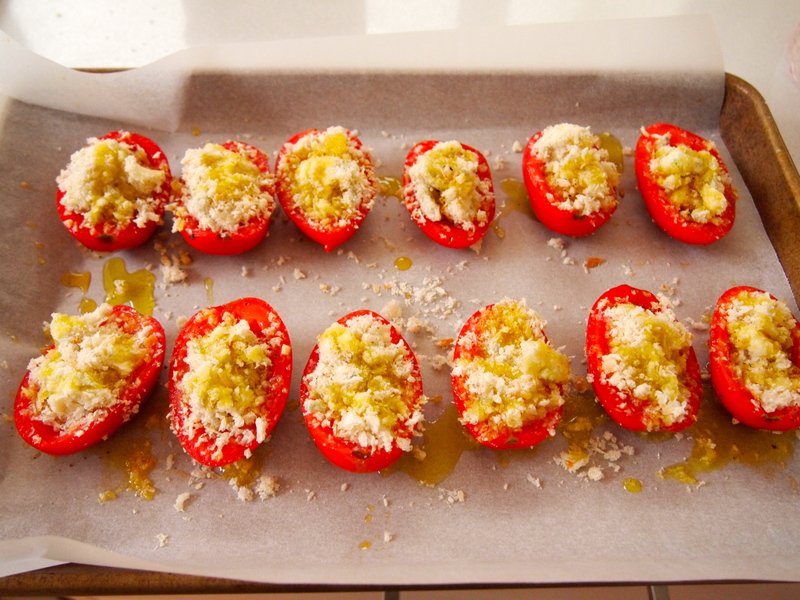 Place the marinated tomato halves, cut side up, on a parchment lined baking sheet. 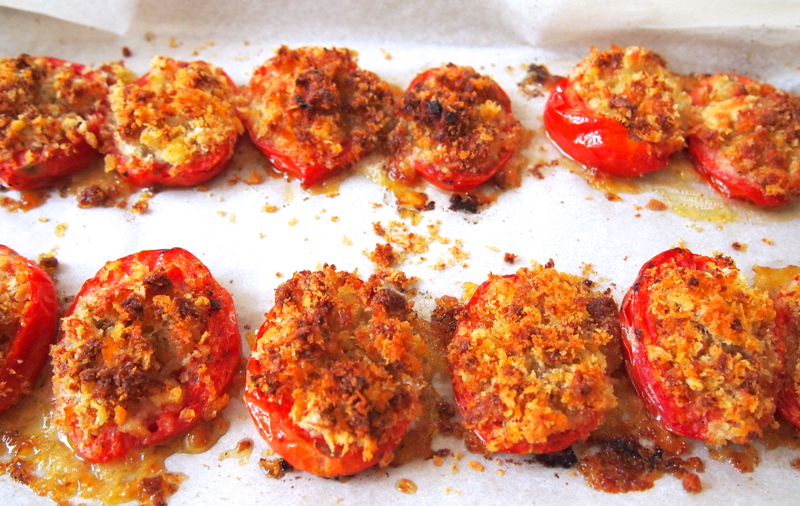 Fill each tomato half with the bread crumb filling. Drizzle with olive oil and bake for 25 – 30 minutes until slightly softened and the bread crumbing topping is golden brown. Arrange the cooked tomatoes on a serving platter and serve while hot.